Welcome to the fourth in our ‘Off the Beaten Track‘ Cambodia series. 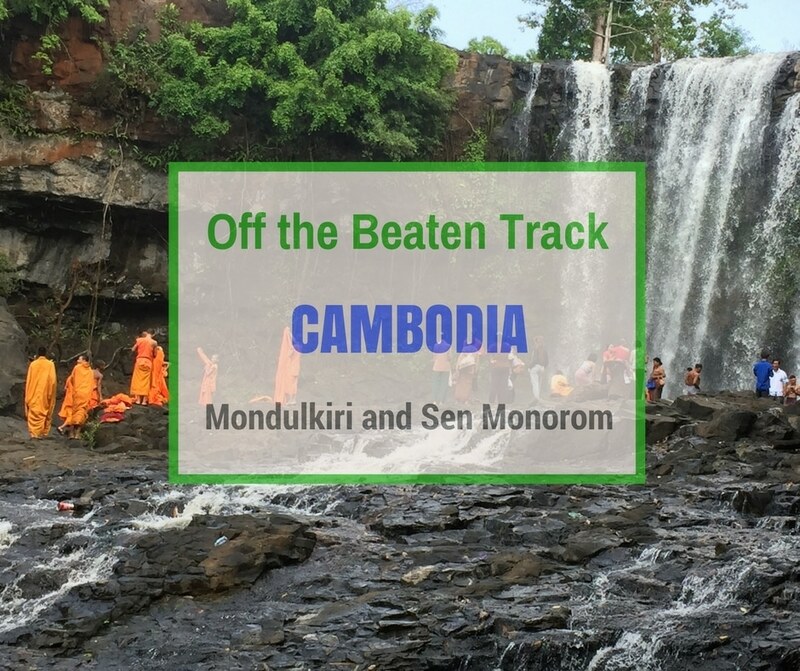 As explained in the first of the series – Off the Beaten Track Cambodia – Kulen Mountain Day Trip, we’re trying to visit and write a new off the beaten track destination in Cambodia every month. We hope to encourage people to spend more time in Cambodia and to experience what it has to offer away from the more touristy places. In April, Andy and I had our first trip together since arriving in Cambodia and headed off to Mondulkiri for five days. Located in rural Northeast Cambodia is Mondulkiri, the largest province of Cambodia. 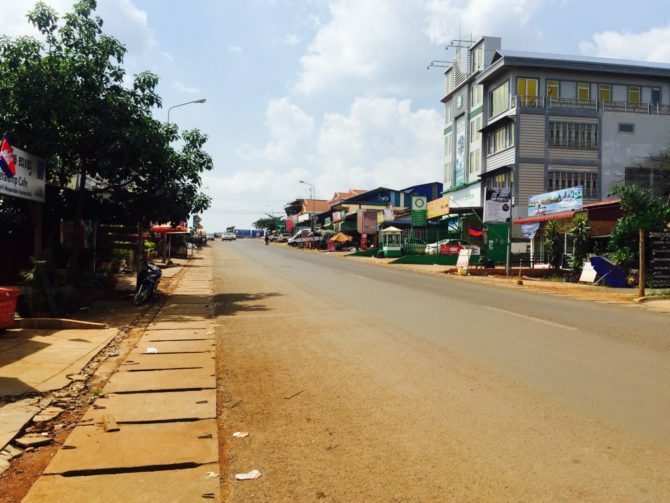 The capital of Mondulkiri is the town of Sen Monorom, which is the best base for exploring the province and is where we stayed. The weather is several degrees lower and the traffic and dust significantly less than in Phnom Penh and Siem Reap. This means it offers a refreshing change to the hot, humid tourist hubs. The main attraction of Mondulkiri is, of course, the Asian Elephant and is often the only reason travellers consider heading there. However, aside from these gentle giants, Mondulkiri’s forests (despite the growing deforestation), waterfalls and picturesque rolling hills, offer a selection of other things to see and do whilst you’re in the area. We managed to fit in quite a few of during our visit. For many, including us, the opportunity to visit and/ or volunteer at an Elephant Project is the initial pull towards visiting Mondulkiri. 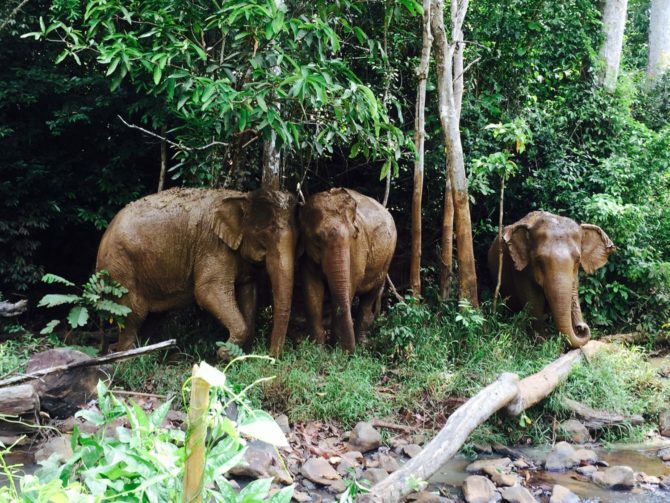 There are several elephant projects in the province, which are either Non-government Organisations (NGOs) run elephant sanctuaries or community project run by the local Bunong tribes in conjunction with organisations such as WWF. Recently there’s been much debate about which type of elephant project is best. Ultimately it’s down to each individual to do their own research and make an informed decision whether to support an elephant project (by visiting or volunteering) and if they do, to decide which they believe is the most ethical. 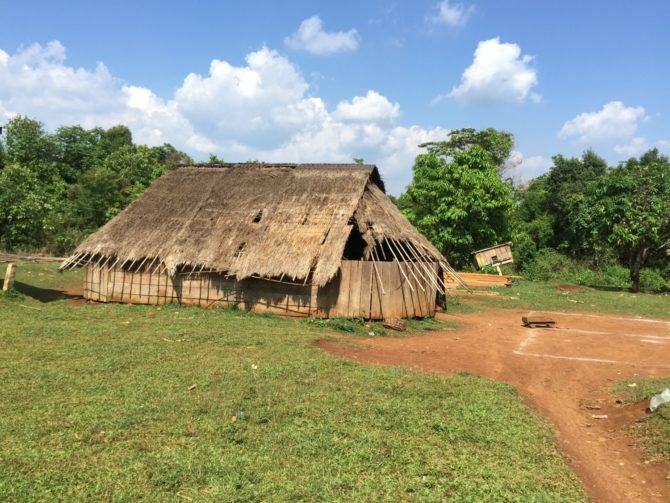 Following extensive research, we decided to visit and volunteer at Elephant Valley Project which I’ve reviewed in Elephant Valley Project Mondulkiri – An Ethical Elephant Sanctuary | Cambodia. About 10 km outside of Sen Monorom just off the main road at the mouth of a green valley is Pou Lung Village. This village is the home to mainly indigenous tribes such as Krueng, Bunong, and Stieng, whose livelihood is agriculture. There are several great examples of round wooden and straw houses which are still constructed using traditional methods. We were welcomed into one of the houses by an elderly gentleman with a big smile. He had no English but with some gesticulation and a bit of translation from our tuk tuk driver he gave us a brief tour and some information on their construction methods and way of life. 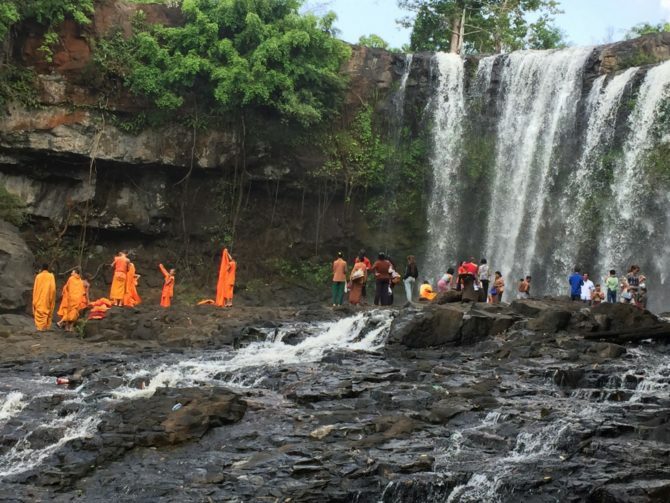 The most talked about waterfall in Mondulkiri is Bou Sra Waterfall which can be found 35 km along a paved road from Sen Monorom. Bou Sra is a triple drop waterfall and the first two stages are very popular with locals, especially during holidays and festivals. They bring picnics, bathe, swim and relax in its waters. The third stage of the fall can’t be reached as it’s in a dense forest and is dangerous due to the fast flowing water and the dangerous animals that are said to be in its vicinity. I would imagine in wet season Bou Sra Waterfall is pretty impressive, unfortunately, it was dry season when we went and only the top tier and the drop to the third tier with much water. Despite this, there were still several locals, including a group of orange-robed monks bathing and generally having a lovely time! Be prepared for a slight trek to reach the waterfall past some local vendors and then through a shaded forest rich with noisy birdlife. Near the waterfall, there are a few more food and drinks vendors. Bou Sra now has a proper visitor centre and walkways have been built leading to the waterfall. It also has the highest ziplines in Mondulkiri with seven lines and a sky bridge. These were built by the same people that are responsible for Flight of the Gibbon/ Angkor Zipline in the Angkor Archaeological park so I assume it’s pretty safe. A half day here is $69 USD (£53 GBP), which was outside of our budget so we gave it a miss. A short way out of town is a viewpoint on a hill topped with the Samot Choeur pagoda. There isn’t much to do here BUT the views of the aptly named ‘Sea Forest’ are worth a quick look. All you can see for what seems like miles are green tree-topped hills, which resemble a rolling sea. If nothing else it’s a good photo opportunity on the right day so don’t forget your camera. Heading back towards Sen Monorom from the Sea Forest is yet another hill (Sunset Hill), the home of the small Phnom Doh Krokom Pagoda. A viewing platform has bee built just past the pagoda on the edge of the hill which gives a great view of the town. As the name of the hill suggests I would imagine it also offers a good sunset, however on the day we went it was pretty hazy so we had a quick walk round and left. This may sound like a silly thing to add into the must see and do section…but, if like me you struggle to relax and do nothing, Sen Monorom is the ideal place to do just that. There are several nice places to stay in town, many of which have outside areas, balconies and hammocks etc. so if you have the time, grab a good book and chill out for a while. Hefalump Cafe – this small cafe on the central road between tracks that lead to the market is the place to go for a slice of cake and a cup of tea or coffee. It has a lovely little courtyard area out the back where you can relax and friendly helpful staff who are mainly volunteers at the Elephant Valley Project. We had a huge pretty tasty slice of carrot cake and a cuppa there whilst we waited to go to the EVP. From memory, I think it was about $3.50 USD (£2.70 GBP) for both, but I may be wrong. Khmer Kitchen – situated opposite Hefalump cafe we ended up eating here twice. The first time for lunch as soon as we arrived, we both had Khmer Chicken Curry for $2 USD (£1.50 GBP) each. It was just o.k. I’ve definitely had better, but for that price, you can’t complain really. The second time we ate here was out of necessity on our second night as everywhere, and I mean EVERYWHERE was closed. I didn’t fancy having a ‘hangry’ Andy to deal with so we decided to give it a second chance. I actually can’t remember what we had but it was much better than the day before and the same very reasonable price. What we really liked about this family run place was how friendly they were. The owners’ adult son came over with his Bluetooth speaker so we could compare music and chat with him whilst we ate. It was a nice end to that day. The Hangout – luckily we chose to eat here on our first night as it was closed on the second. It’s a nice relaxed spot serving chilled beers and a selection of good quality and priced Khmer and Western dishes. We both opted for a chicken burger and chips as we fancied Western for a change. They turned out to be some of the best we’ve had, and for around $5.50 USD (£4.25 GBP) each, reasonably priced too. This place is supposed to be popular with travellers and expats and we could understand why, there’s a nice atmosphere with good music, along with a pool table and table football to keep you amused. There are several other recommended restaurants and a couple of bars in town that we didn’t get a chance to try. These include The Greenhouse, Chili on the Rocks, Mondulkiri Pizza, and Cinnamon Cafe & Bakery. Sen Monorom isn’t known for its nightlife so everything shuts by 11 pm so be prepared for some early nights. 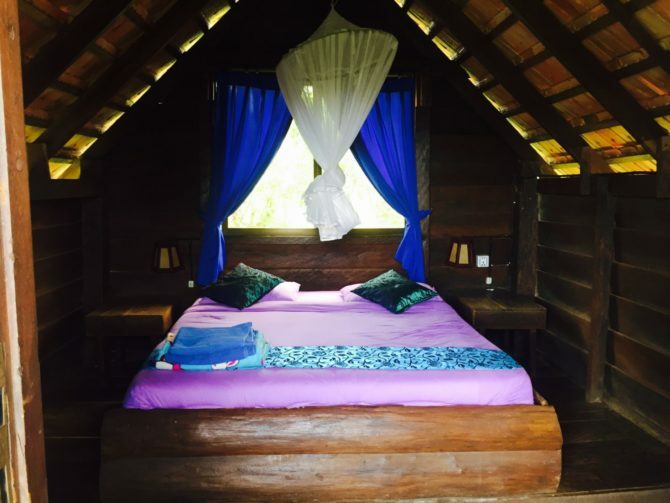 We were hosted for our last two nights in Sen Monorom at Nature Lodge. I’ve reviewed this below, along with another couple of accommodation suggestions. Read more in our full Product Review Disclosure. 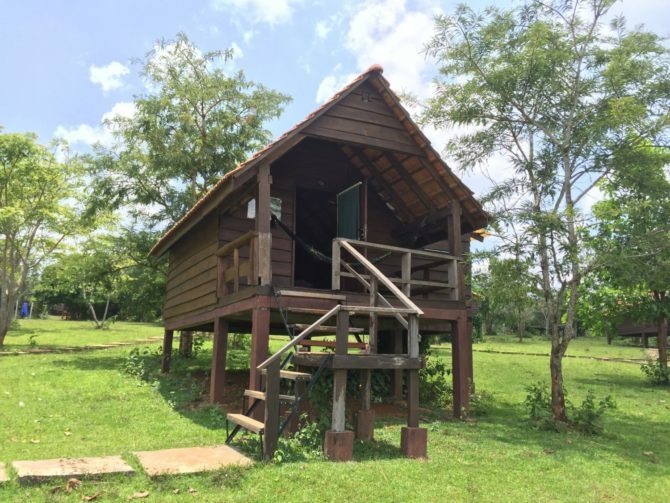 Nature Lodge provides vocational and ecotourism training for disadvantaged locals and also supports community-based conservation projects budget. It’s a family friendly resort run by an Israeli-Khmer couple and is located a short tuk tuk ride or 20-minute walk outside of Sen Monorom town. The resort offers good quality, budget wooden bungalows in a peaceful, picturesque rural setting. Prices range from $15 to $50 USD (£11.60 to £38.90 GBP) per night depending on occupancy and type. The reception is located in the spacious bar and restaurant which is the first building you reach from the carpark. The staff welcomed us with smiles and after some initial confusion over the booking, we were quickly shown to our bungalow. The bungalows are dotted around a large fenced in property on a slight slope between trees. Each bungalow is a nice distance from the others, allowing you your own privacy. We stayed in a double bungalow, which had its own shower room and toilet, and balcony. It was simple but perfectly adequate and spotlessly clean, including the bedding. It also had a very good quality mosquito net above the bed and hot water. You couldn’t really ask more of a rustic stay in the countryside. On our balcony was a small bench and a hammock, from which we were treated to a stunning view of all the way across the trees to the opposite side of the valley. You could even take your own hammock, like I did, which I strung up out the front of the bungalow to chill out in. 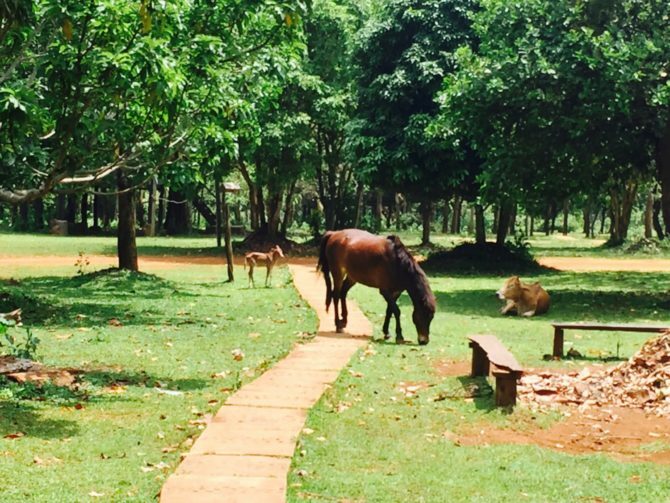 That along with the horses, cattle, dogs, and cats that roam freely around the resort, really make you feel at one with nature. The perfect setting to relax with a book. The restaurant and bar was a lovely big space to sit and eat or have a drink looking out over the grounds. There’s also a pool table you can enjoy and some musical instruments if you’re that way inclined. There’s a good menu with an extensive selection of Khmer and Western dishes, including pizzas and desserts. Considering the slightly remote location we thought the food was fairly priced, despite being slightly more than in town. Being the only place to eat in the evenings unless you get a tuk tuk into town it can get quite busy, but this was fine for us and it had a nice atmosphere. The staff were extremely friendly and happy to help; the second evening they even lit a fire pit for a family so their children could toast marshmallows. The only downside was the bar and restaurant closes at 9 pm, however, we actually liked this in the end as it forced us to get an early night and catch up on some much-needed sleep. The lights and wifi remain on 24/7. Andy also shot a vlog on Nature Lodge which shows you around the resort. During our time in Mondulkiri, we also spent a few nights in Phanyro Guesthouse. This was also a lovely place to stay and in a perfect location if you need to be in town early to meet for a trek or an elephant project visit. It was clean and tidy and at only $7 USD (£5.50 GBP) for a double room, an absolute bargain. There are several other budget places to stay in town. However, if you want to splash out, other places to stay include the fully serviced River Dolphin Hotel which is about 2km out of town, with rooms from $16 USD (£12.80 GBP) a night and the budget Balcony Guesthouse. This has dorms and private rooms from $5 USD (£4 GBP), although it should be noted the bathrooms are shared. It has a great location and a big balcony with great views over the Mekong. The most common routes to Sen Monorom are from Siem Reap and Phnom Penh. I’ve bundled these together because if you start in Siem Reap, you’ll have to go through Phnom Penh. It’s a long journey to get to Sen Monorom from Siem Reap but pretty straightforward. JC Airlines are also worth checking, although they can only be booked through the Ctrip website. Once in Phnom Penh you’ll need to get an express mini-van to Mondulkiri. There are a couple of options including Kim Seng Express and the TVT Mondulkiri Express which we took. It left at 7 am, took another five or six hours and cost $11 USD (£8.50 GBP). The only downside to this was we had to wait around for the TVT Mondulkiri Express office to open, the area it was in was dark and felt a bit dodgy so we went and waited with a coffee in a gas station for an hour until it was light. We book all our bus tickets in Cambodia online via Cambo Ticket. 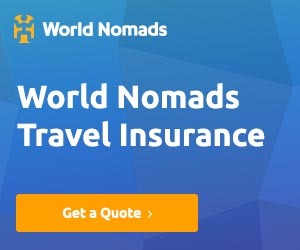 You could of course also get a taxi from both Siem Reap and Phnom Penh but it would cost around $100 USD (£77 GBP) and $200 USD (£154 GBP) respectively. You can also reach Mondulkiri from Sihanoukville, again via Phnom Penh, or from Kratie and from Ratanakiri. Unless you opt for a taxi, these routes will all require you to catch an express minivan which can be arranged from most hotels, guesthouses or travel agencies. They will also be able to inform you of the current times and prices. 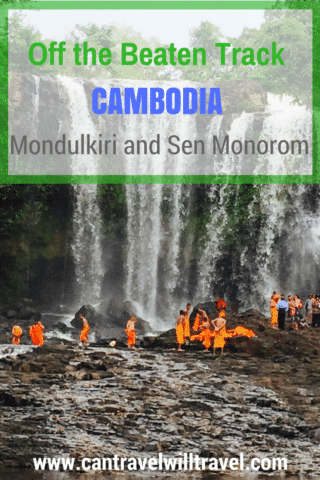 Sen Monorom isn’t very big which means it can easily be explored on foot, however you can also rent a bicycle from some guesthouses for around $3 USD (£2.30 GBP) which means you can go slightly further afield. You can also rent a motorcycle in town for around $7 USD (£5.41 GBP), which would enable you to go much further and explore the surrounding area at your leisure. If bicycles and motorcycles aren’t your thing there are also a few tuk tuks in town which you could arrange to take you around the sites. They are fairly recent arrivals and as such are still in very good condition. We paid $30 USD (£23.20 GBP) for an afternoon tour to the sites I mentioned above. Guided Trekking – If you want to really get off the beaten path, then a guided trek is your best option. Treks of various lengths and difficulty can be arranged at some of the guesthouses and restaurants/ cafes. I’d been really keen to do at least a one day trek whilst in Mondulkiri but, for us, our trekking ended up being just through the forest as part of our EVP visit. We had booked on a day trek with L.E.A.F. but Andy wasn’t feeling great and I was enjoying just relaxing (for once), so we decided to leave the trek for another time. Other Waterfalls – there are several other waterfalls in the area including Chrey Thom, Chrey Yos, Lék Pok Bras and Lèng Khin. There’s also Sen Monorom Waterfall, however, this is supposed to be covered in rubbish so may not be worth a visit. For all of these, it’s better to visit during or soon after the wet season. Other Villages – There are several other villages in the region such as Pahlung Village which is about an hour from Sen Monorom and on the way to Bou Sra Waterfall. Coffee Plantation – This little plantation is just outside of town and sometimes does tours if you pop in. It also has a restaurant where you can try the excellent Mondulkiri coffee. Many of the things mentioned above could be easily done on a day trip in a tuk tuk or by motorcycle (you can rent one and drive yourself, or rent one with a driver). 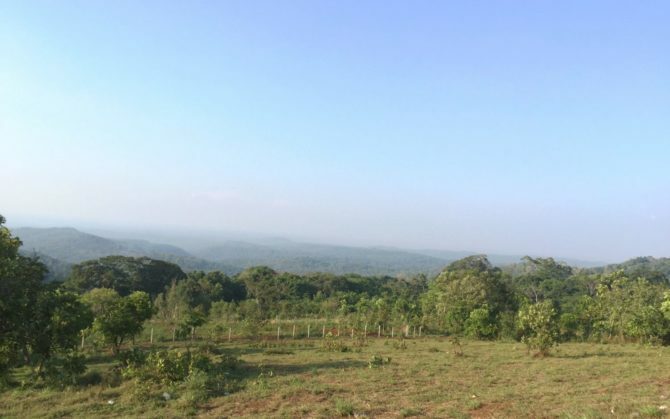 Have you visited Mondulkiri? Have I missed anything there is to see off the beaten track? Product Review Disclosure: Nature Lodge provided us with a complimentary two-night stay. This did not influence my post in any way and as always I’ve provided a balanced and honest review. It is nice to read about other places and things to do aside from the mainstream attractions. Thanks for sharing! Getting away from the touristy areas is something we love so I do like to share some of those experiences. Very detailed, I love that! Going to that part of the world is still at the stage of daydreaming but if it ever happens I’ll have this to help find my way  Meanwhile, I can dream about in more details! How awesome! I’ve always wanted to visit Cambodia. (Heading to your Elephant project post next!) It’s great to know that Sen Monorom is a good place to relax.  I struggle with that while traveling as well. I hope you get to visit Cambo at some point – it’s fantastic – especially when you get away from the crowds. Great post!! I have wanted to explore more of Southeast Asia, especially Vietnam and Cambodia, and will definitely keep this in mind when designing my itinerary. Thank you! You’ll have a fantastic time when you go! We are hoping to visit Cambodia next year – away to binge read the rest of your posts! Those nature lodges look amazing and to see the elephants would be a dream come true…definitely saving this for later! They are definitely great places to visit – I plan to go back when we return to Cambodia next year! Wow totally different Cambodia than what I expected. Will definitely consider this before travelling there. Cambodia’s amazing – especially away from the touristy bits. Cambodia is too much fun! Need to visit it soon! Yes it really does have some great places to visit here. I just keep discovering more and more! Wow totally a different Cambodia that I have seen in postcards!! Will definitely consider visiting this place. Yes the postcards often show just Angkor Wat, which although amazing and unmissable is only one thing in this wonderful country! Glad you found it helpful, I hope to add some more to the series in the coming months so watch this space! I am just back from 8 days tour of Siem Reap. I focused only on the Angkor Temples. These off beat destinations of Cambodia too seems interesting. I hope I can do a dedicated tour for just these places. I hope you enjoyed the Temples, they really are a must see when visiting Cambodia. I’m sure you can arrange a dedicated tour for the Off the Beaten Track places, although it’s easy and much cheaper to do it independently without a tour operator or guide! If you ever have any questions feel free to PM me! An off-the-beaten path, now we’re talking. To be honest, I am more interested to explore places that are not known to tourists because they tend to be more raw. The places you mentioned, I have never heard of them before and they all look interesting. I want to visit the Bousra Waterfalls in particular. I completely agree, I love getting off the Beaten Track. I feel it’s more of an adventure and I love visiting places that aren’t overrun by tourists! Thanks for reading ? We missed Mondulikiri while we was in Cambodia and chose to go to Ratinikiri instead. Looks as though we missed out on some amazing places. Wish we had time for both but you simply cannot go everywhere! It’s so hard to choose between places sometimes isn’t it! How did you find Ratanakiri? I haven’t been yet but want to try and fit it in before we leave Cambodia. Thanks for presenting a different perspective of Cambodia. This goes beyond the likes of Siem Reap and Angkor Wat. The elephant projects are something that has immediately caught my attention. As you say one needs to research and then decide on which to volunteer. Apart from the elephants, the landscapes are really bewitching and pristine. Would love to get there some day. Yes absolutely, if you do get chance to go feel free to contact me if you have any questions ? Really informative post. The nature lodge you stayed at looks lovely. I would love to do the zip lining but I’m not sure it would be in my budget either! Thankyou, yes the Nature Lodge was lovely, so relaxing! Just couldn’t justify the zip lining cost this time!